Many non-profit organisations receive grants for particular projects on a regular basis. These grants may be received in advance of the actual period to which they apply and are accounted for in your accounting records by receiving them to a liability account and then journaling the monthly allocation to an income account each month. Calxa has no built-in method of setting the cashflow for grants in advance. Please note while we are using MYOB in this example the same principles apply to all accounting packages. In MYOB, add a new liability account, close to the Grants Received in Advance account and call it Grants Allocated or something similar. Note that if you receive multiple grants in advance, it’s advisable to set up separate pairs of accounts for each grant – this will make reconciliation simpler. 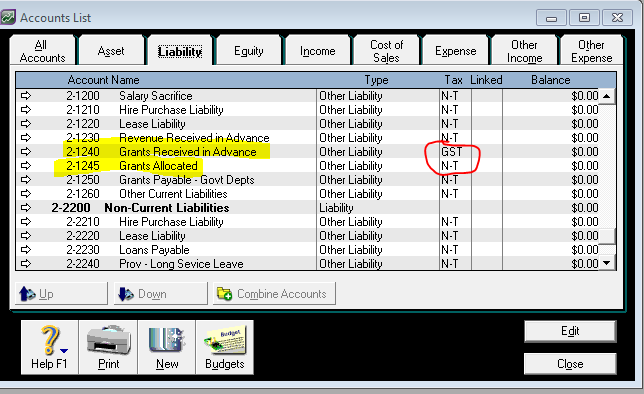 Ensure that the Grants Received in Advance account has a default tax code of GST (unless your grants don’t include GST) and the Grants Allocated is set to N-T.
Each month enter a journal to credit the relevant income account (and job number) for the grant and debit the Grants Allocated account. At the end of the financial year, or when the grant is fully allocated, credit the Grants Allocated account with its balance and debit the Grants Received in Advance account. Set your income budget for the grant to the monthly amount you will journal. Set the budget for the Grants Received in Advance account to the amounts you expect to receive (excluding GST) in the months you expect to receive them. Set the budget for the Grants Allocated account to -100% of the income account – this will reflect the debit side of the journal. 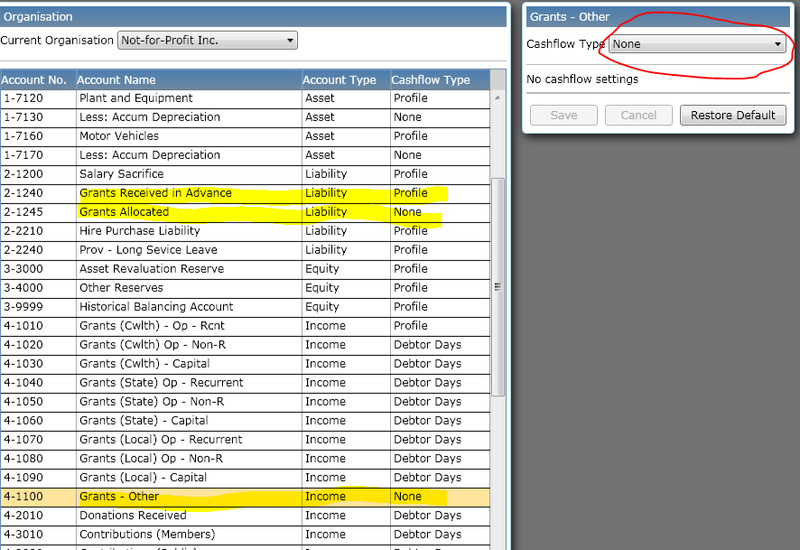 Set the Cashflow Type for the income account to None (as the transactions on this account will have no effect on cashflow). Set the Cashflow Type for the Grants Received in Advance account to Profile and 100% Current (the funds will be received in the budgeted month)The Cashflow Forecast will then show the correct cashflow when the grants are to be received. The Balance Sheet forecast will show two lines for Grants Received and Grants Allocated which together will show the net balance of the unallocated grant. You could create a header account in MYOB to summarise them to get a net balance.